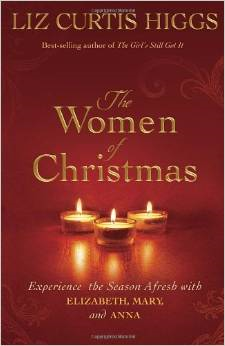 Women of Christmas Bible Study Begins Tuesday, November 25! Anticipation fills the air in our household as plans are being made for Christmas. Our daughter will be home from college for a month. Our newly married children, who delayed going on their honeymoon, will be returning from a two week honeymoon trip to Europe. Our extended family, who live in Arizona, are coming home as well. My sweet mama will have her entire family in one place this Holiday season – something that rarely happens. Just to see the glow on her face and the joy in her heart, makes me anticipate the arrival of this Christmas even more. Over the next 5-6 weeks, I am also looking forward to sitting quietly and reading my Bible and the book Women of Christmas. It is written by a favorite author of mine – Liz Curtiss Higgs. The familiarity of these Christmas stories can tempt me to read the scripture passages quickly. But, I am asking God to give me a fresh new glimpse of each of the stories – stories that are gifted with words from the Holy Spirit – words that have the power to change our thinking…change our loving…change our serving….change our living! You are welcome to get the book and read along with me. Each week, I will announce the chapter reading assignment. If you don’t want to get the book, you can simply join in reading the Grace Full Journey blog postings, which will recap the bible story and offer heart-challenging application with each devotional…things that God is showing me as I read these passages. I would love to have you join me on this “Women of Christmas” study journey which will begin tomorrow, November 25th. I will try and post on Tuesdays and Thursdays. I am looking forward to all the things God wants to unfold in this study. I hope you will post in the comment section of each devotional what God is teaching you on this journey as well. Please feel free to share this email with your family and friends. They can have the blog postings delivered right to their email address by signing up on my website. Thank you, Kath! I ordered my book yesterday and look forward to journeying with you this Advent season. I am so thrilled to have you! I know that the intentional quiet in your home will be a blessing right now! Much love to you my sweet friend!